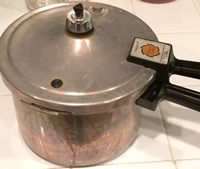 I wrote some months back that I was trying to use my old stove-top pressure cooker one evening to cook beans for tostadas and I couldn’t get the lid to close, so I used the electric pressure cooker instead. It turns out that I had had a brain lapse and I was trying to secure the lid left to right instead of right to left as I should have. Recently I pulled out the pressure cooker again. I got the lid properly closed, but when it came up to pressure I did not hear that reassuring jiggling. What I did see was steam coming out around the handle. Not good. I turned off the heat and let the pressure drop. The beans were not cooked and the water was mostly gone. I ordered a new sealing ring. When it arrived I put it in and did a water test. I filled the cooker about a quarter full with water and turned on the heat. The cooker came up to pressure and I once again heard that reassuring jiggling. When I took off the lid I discovered there was very little water loss. That was a relief. I’ve had that pressure cooker since some time in the 1980’s. It’s nice to know that it’s still going.